So I've been stressing it a little. It seems like no matter how hard I work, I'm barely treading water. It gets old. I feel like with as hard as I work, I should be more organized, but things just weren't falling together. So I picked up a book about organization at Deseret Book the other day. I decided I would go through 1 idea at a time and implement it and see if it could help me figure out how to work smarter since I'm working plenty hard already (not that you would know it). One of the first ideas was how to help kids get in the habit of picking things up as they walk by them, without being asked. So I took the idea and planned a family home evening around it. First I went to Broulim's and bought some Mason jars (which Mason thought was awesome). I pulled out scrapbook paper, Elmer's glue, ribbon, scissors etc. I also bought the brightly colored straws from the store. 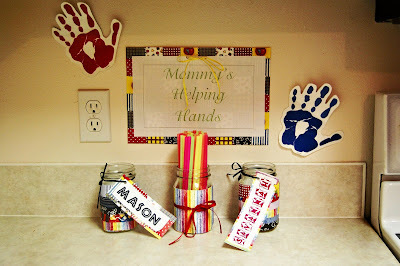 The kids and I cut strips out of the scrapbook papers, glued them around the mason jars, and decorated them up. I made name strips for the jars and tied them around the tops. Then I made a third jar. I took all the straws and cut them off just before the bendy part, and filled the jar with them. After all the deco was done, I explained to the kids what they were for and how it works. In the middle jar are the straws. On either side is one of the kids jars (empty). Each time they pick up something that is NOT their own, without being asked, they come tell me. I let them pick a straw to take out of the middle jar and put into their jar. We set up a cupboard top in the kitchen where they sit, along with a sign that says Mommy's Helping Hands, some handprints, and the prize list. The kids are able to trade in their straws for prizes off the prize list. For example, 5 straws buys a treat, 50 straws and you can get your nails painted, 100 straws gets you a Webkinz, while 200 straws gets you a night out with mom or dad. The kids think this is the BEST THING EVER! They are running around my house, still, looking for anything that is out of place and putting it away! We also told them that if I pick up anything of theirs, I get to take a straw away. If Mason picks up something of Savannah's, he can take a straw from her jar and put it in his and vice versa. This helped them to not just leave everything out and let the other person pick it up (since they don't get straws for putting away their own stuff-they should do that anyway!). Mason rushes home from school asking if he can earn straws. They count them up and see how many more they need for the prize they want. Yesterday he came home and said, "Mom, I was telling ____ about the straw thing and he said, 'No fair! You have a fun mom!" The kids think I came up with the best game ever, and I get a cleaner house with less effort on my part (read some help for once ;)! It's a win win. I would call this one a success. Each week, I plan to do some sort of organizational/motivational idea with them at FHE. But for this week at least, there are no longer all sorts of random items laying around my house at any given time. WOW! I'll have to try that one! I'll need to get a jar for my hubby and I as well though, my kids definately learn it from me! But that is really a fantastic idea! What is the book called? I love this idea. Do you think it can work for a 3 and 4 year old? Best of luck. I hope your kids keep up the good work. What a great idea!! I think I might have to try that one too!! That is a great idea! I frequently feel the same way about me versus them when it coming to picking up after everyone. It is very frustrating. I may have to copy your idea.Those jars sure are cute! We do something similar. I bought some of the "rocks" you put in the bottom of an aquarium and some small containers. Everytime the kids do anything good (their chores, being nice, etc) I give them what they call a "ruble" and we have a ruble store with toys and stuff the kids want and I price the stuff according to what I paid for it and then they use the rubles to buy toys. I was afraid it would wear off but it has been months and is still going strong. I'm totally taking this idea! It sounds great, and my girls will do anything to get their nails polished! This is the cutest idea ever! You are so creative, these turned out to be adorable!! Let me know how it goes! The book is called "Project Organization" by Marie Ricks. I took the jar idea from her, and then just added the decorations, prize list etc on my own to make it more interesting for my kids, and to involve them in setting it up in the first place. Adrianne, I think it would definitely work for 3 and 4 year olds. Savannah is only 5 and she thinks it's great! Last night, they had earned their Webkinz so I took them to Idaho Falls and let them pick them out (left Dad home with the babies). They are so excited! What a great idea!! I love it!! I want to try it.. but I am sure mine won't look as great as yours- I am not so crafty!! Brilliant! I could really use some of that willing help around my house! What a super cute idea! We did that with a point system and it died down really fast because I don't think it was visual enough so maybe I will give this method a try. I'm also interested in that book...sounds like there are some great ideas! You're always so creative, AnnaMarie. What a great idea to keep the kids involved. I"ll have to keep it in my memory bank for the years to come.